Ever since having our doors dipped a few weeks ago, we’ve been trying to decide on what to do with them now. 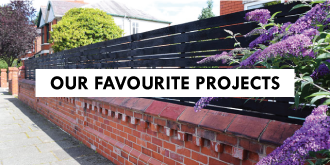 We’d always planned on painting all woodwork in the house white, but after seeing the amazing transformation from yucky and chipped paint to clean and natural wood, we’ve been struggling to decide on what to do. Having already stripped, sanded and more importantly repainted our bathroom and living room doors, keeping them natural would probably mean having to strip those two doors again. Needless to say it’s not really something that we’d be keen on doing again! But, after a few weeks of trying to decide, we have finally made a decision! 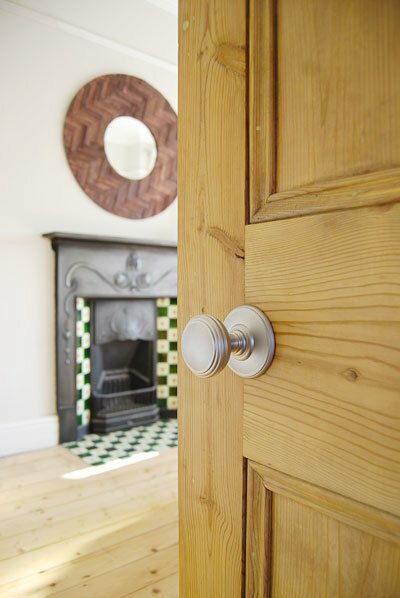 Because we love the contrast between the white painted frames and the wood we’re keeping the natural wood doors! Were really happy to have finally made a decision, but to actually get the doors to a state that we can call finished, a bit more work is required. 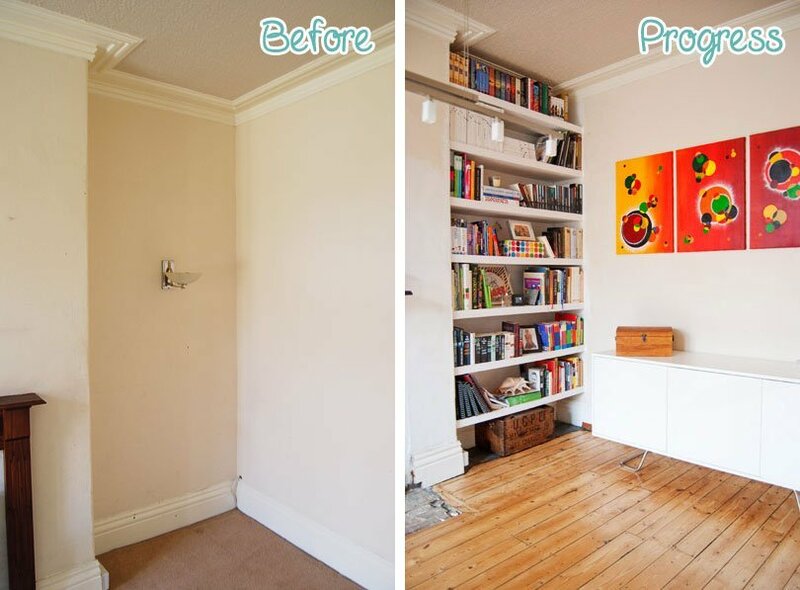 At the moment, it seems like every DIY job around here that we decide to tackle involves the same first step – sanding! I can’t tell you how sick of sanding I am, but at least having the doors dipped removed most of the paint and gunk so that not too much work is involved. 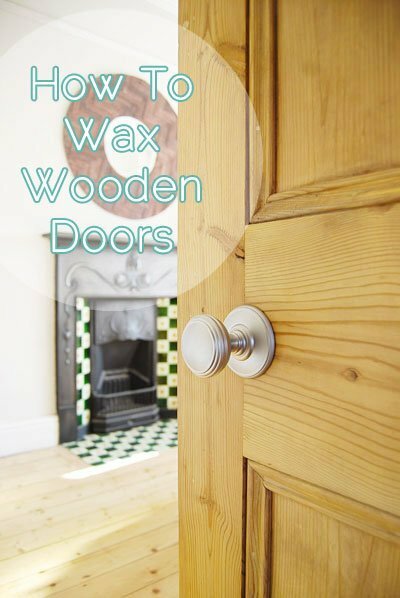 If you’re thinking of refinishing or restoring your doors, this our guide on how to wax wooden doors. 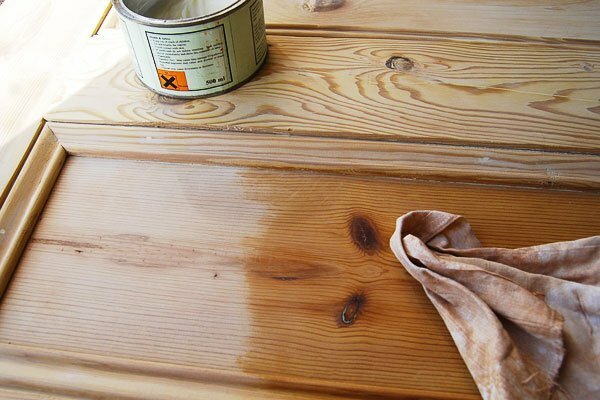 Like any surface that you are going to treat or paint, preparation is the most important step. We took our doors to be dipped, which was amazing and saved us a load of stripping work, but there were still a few little areas of old paint that needed sanding away. You can use fairly coarse sandpaper for this (we used 80 grit) as you will have to sand them again later. Now that the surface is stripped and clean, it’s time to get out the filler. It’s tough to find a perfect filler match, but as long as it’s close and you don’t have any major holes to fill, it won’t be too visible when you are finished. Fill all holes (we had loads because our doors had been boarded up) and then give the door another sand (it’s the last time you have to, promise) with some fine sandpaper (we used 160 grit sandpaper on a palm sander). 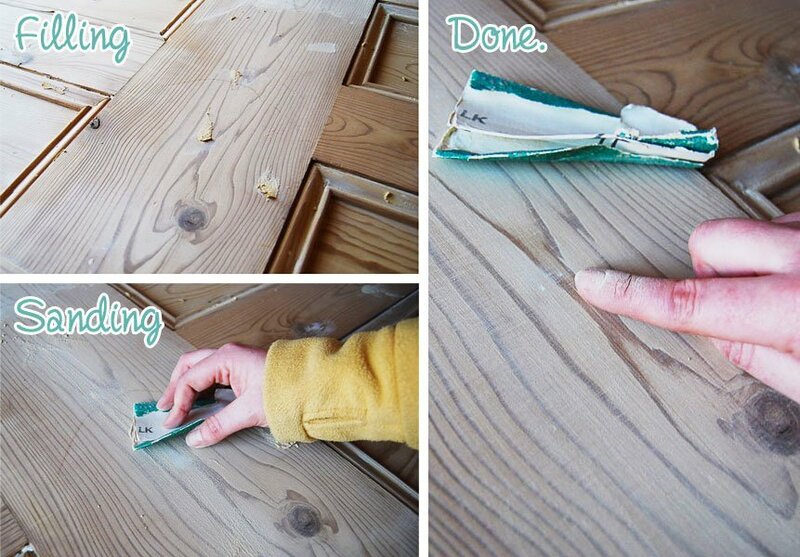 Remove all of the dust from sanding and make sure your surface is completely clean. Now you can break out the wax! Using a soft cloth, scoop up some of the wax and start to massage it into the wood in a circular motion. Wait a few minutes to let it dry and then, using a clean rag, start to buff the door moving along the grain of the wood. The more you buff it, the shinier it’ll be. that we used and loved), it actually changed the colour of the wood quite a lot. At first the waxed area seemed a lot darker, but actually it wasn’t really darker (and it also seemed to dry a bit lighter), it was more that it brought out the colour and grain of the wood. That’s all there is to it. 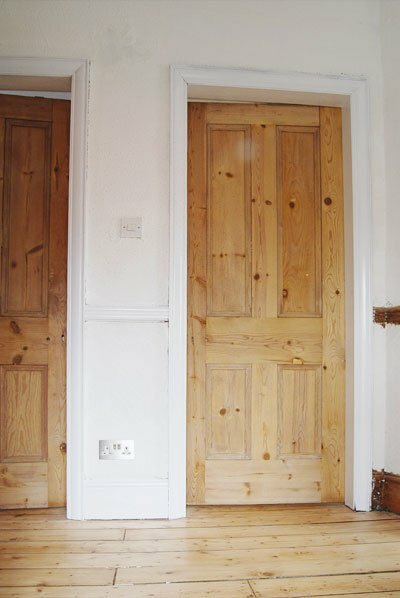 Each door probably took about 2,5 hours to sand, fill and wax which made it a really quick and easy DIY job to do. It was also so much quicker than painting them and didn’t require a load of drying time between coats of paint either. 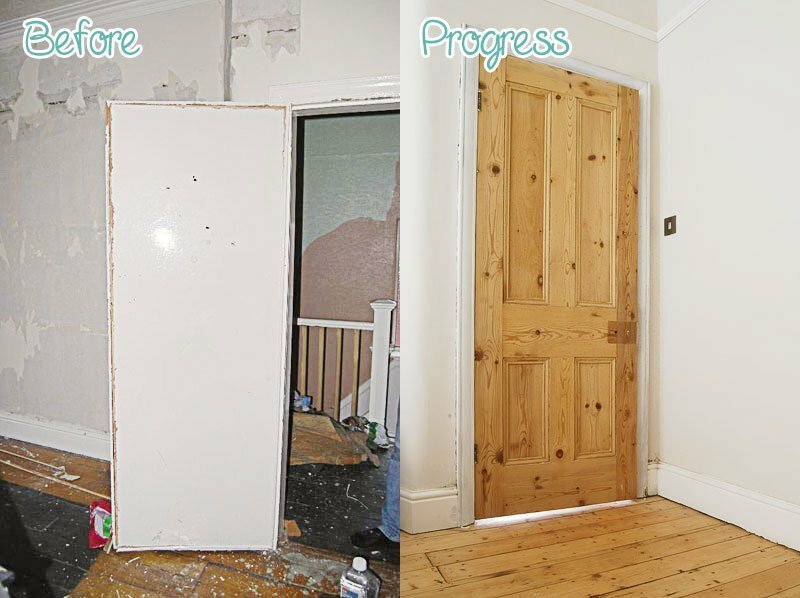 One of the things that we love most about the doors – and you’ll just have to trust us on this – is how amazingly smooth they now feel! Of course they were smooth after sanding, but even after applying the first coat of wax (and without much buffing) the finish is sooo amazingly smooth. It almost feels like a high gloss varnished surface. Admittedly, the visible difference between the waxed and unwaxed door is very subtle on the photos, but in real life the overall appearance is smoother, more polished and generally the doors feel finished – having door knobs again kind of helps, too! Looking right back to the way our doors and hallway looked on the day we moved in you can definitely see a bit more of a difference. 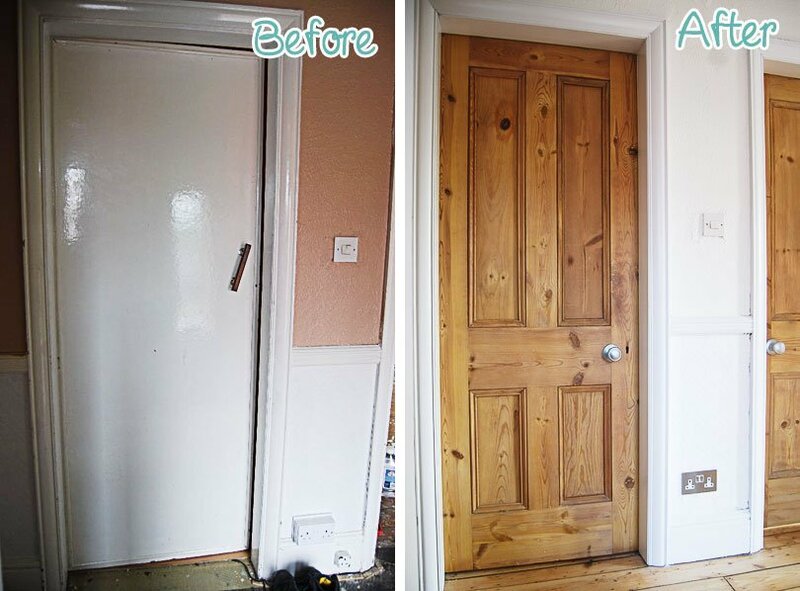 Considering it’s the same door, it’s really not a bad transformation! Do you think we made the right choice in keeping doors natural looking? Or do you think we should have painted them? It was a excellent idea, they look so perfect, I’d stroke them to if I were there! Thanks Magali! Glad you like them! your doors are fantastic, well done to you both. Thanks, Julia – it was really easy to do, but very effective. They look great! I would be petting them too. In fact, I have been petting my cabinets! You made a great decision since it was so much less work. You can always paint them later if you change your mind. Thanks, Jessica! 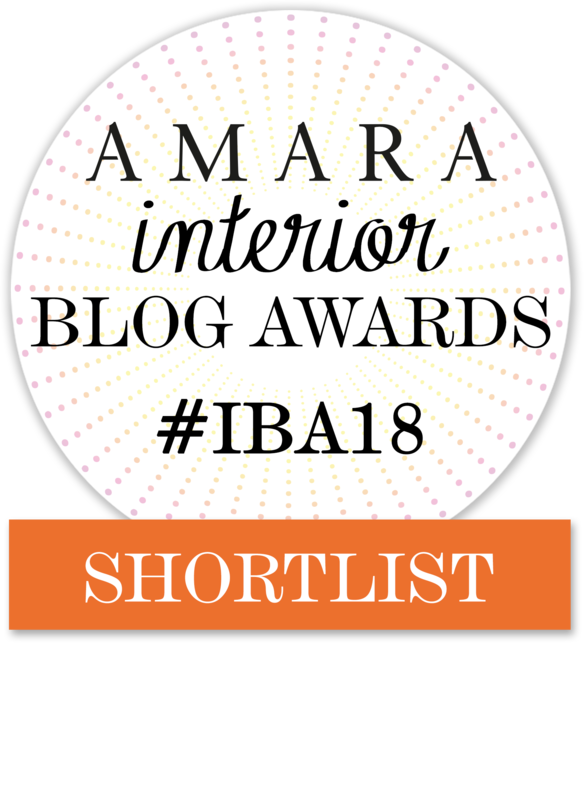 Glad I’m not the only one who finds stroking furniture and doors completely normal! I think you definitely made the right call. So what did you do with the inside of the bathroom door? Did you leave that painted or did you use something to seal it? Thanks, Darrell! At the moment the bathroom door is painted inside and out. Having decided to keep the doors natural, we will eventually take it to be stripped, too. We didn’t bother using a particular paint or seal and up till now the door has been holding up great. 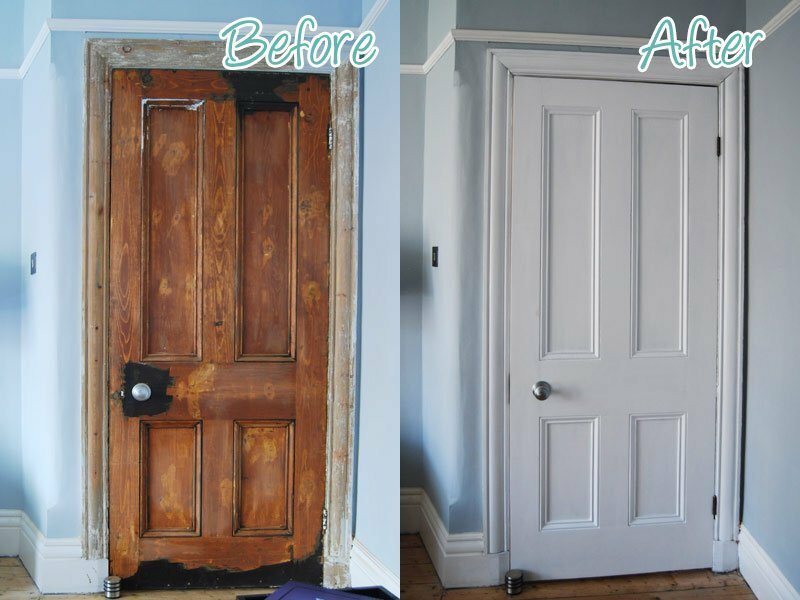 As the doors are the original 100 year old doors, we figured that if the bathroom door held up till now, it’ll be fine with just a coat of paint or wax in the future, too. You made the right choice, they look perfect! I got my doors backed from being dipped a few hours ago and I’ve spent quite a bit of time since then stroking and admiring them so I don’t think it’s strange! I can’t decide what to do either but yours look fantastic waxed. Thanks Karen! Up close you can tell that they are still the originals because of all of the dents and filled holes, but they are over 100 years old and it kind of adds character. Where are your door knobs from? I like them. Thanks Owen! 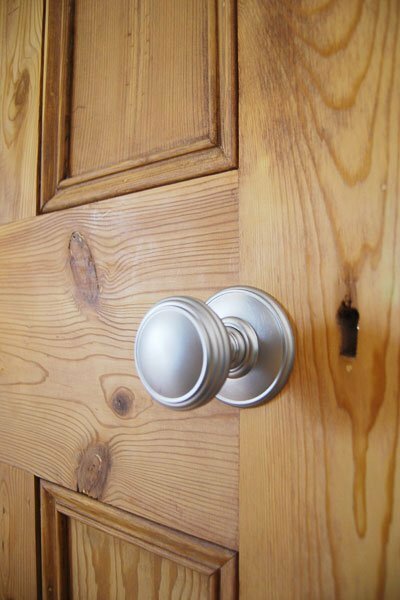 The door knobs are Delamain plain mortice knobs in satin. Thanks, Lindy! Sanding and waxing was much less work than expected. Good luck! We have 5 Douglass Fir doors which were also over boarded and have now been dipped. Thanks, Pete! 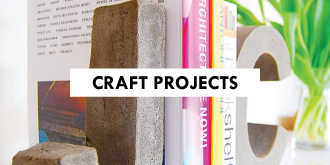 We already had some wax lying around from previous projects and were happy with it. It was easy to use and apply. You can find the wax we used, here . Thank you Pete. Your advice has certainly helped prior to starting to wax my doors. I have an original door which was dipped by the previous owners while the others are new and need some protection. A friend recommended applying a wax treatment. I’m going to see how much the clear wax changes the colour by applying to the top of the door, where it doesn’t show , first. 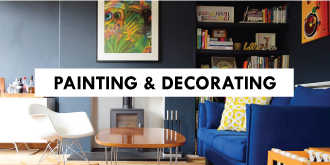 Do you know if you can get paint on wax? I’ve never heard of paint on wax, but the normal stuff works fine and is so easy and quick to apply! The wax definitely changes the colour of the wood and it’ll look a bit darker than before, but it will also accentuate the texture and grain of the wood. Good luck with your doors! Nice to see you fitted the knobs in the right place. What was wrong with the 1960s?!? 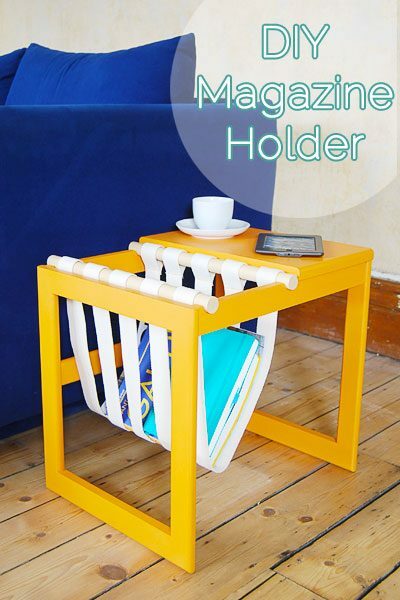 What did you use to fill the holes? 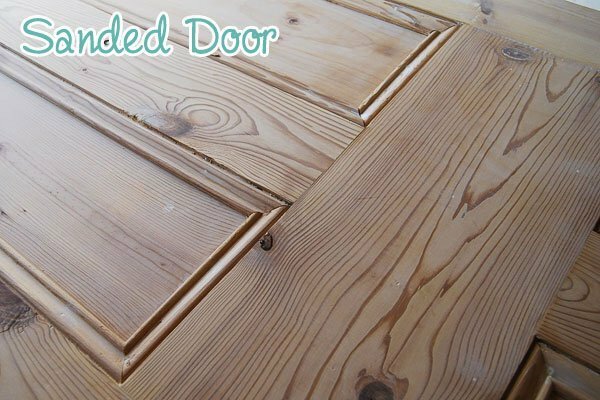 I have been using the sanding dust from the pine doors and mixed with Wood glue and water. I found the colour of course is the closest you can get. I have around 10 doors to sand and then i am oiling with Osmo Raw oil, as that does not darken the wood too much. We used a wood filler that we colour matched as closely as possible. The best way to fill holes is your method, though! 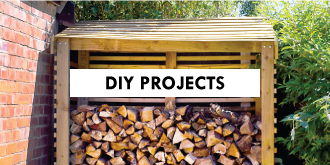 It’s the only way you’ll get the colour to match (almost) perfectly and if you’re planning on staining the door (or whatever it is your filling) the sawdust/glue mixture is more likely to take on the same colour as the rest of the wood, too. 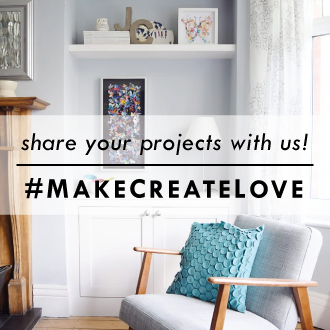 Good luck with all of your doors – I’m sure all of your hard work will pay off! Love this! I’m stripping old dark varnish off doors but had to use paint stripper as couldn’t get them dipped anywhere as they have glass panes. This gives me hope it will be worth it. They look amazing. I have doors upstairs that a friend thinks have been boarded up like yours but I don’t know how to check. What did you do? It’ll definitely be worth it, Audrey! I’d double check about having them stripped though. You may be able to remove the glass and then take them to be dipped. Ours were very clearly boarded up (it had been badly done) so easy to see. Here are some tips to see if yours have been. 1. If you knock on the door are there sections that sound hollow? 2. Is there a central, raised part of the door with a slightly lower edge around (sometimes they boarded up doors but didn’t use a board the exact size of the door)? 3. If you look at the edge of the door can you see a groove in the paint? Or see that the door is thicker than the other doors? This could be the board layer. 4. If you’re stripping them anyway, why not just have a test strip on one of the doors you think are boarded up? Maybe you’ll be able to see more! PS. Don’t forget to check for lead paint! 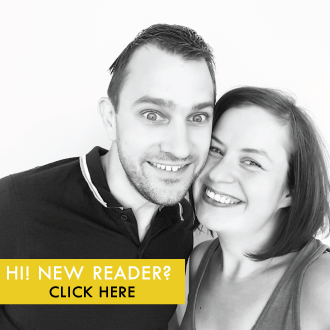 really love your blog as a now single guy trying to get his 1896 flat in Edinburgh updated. 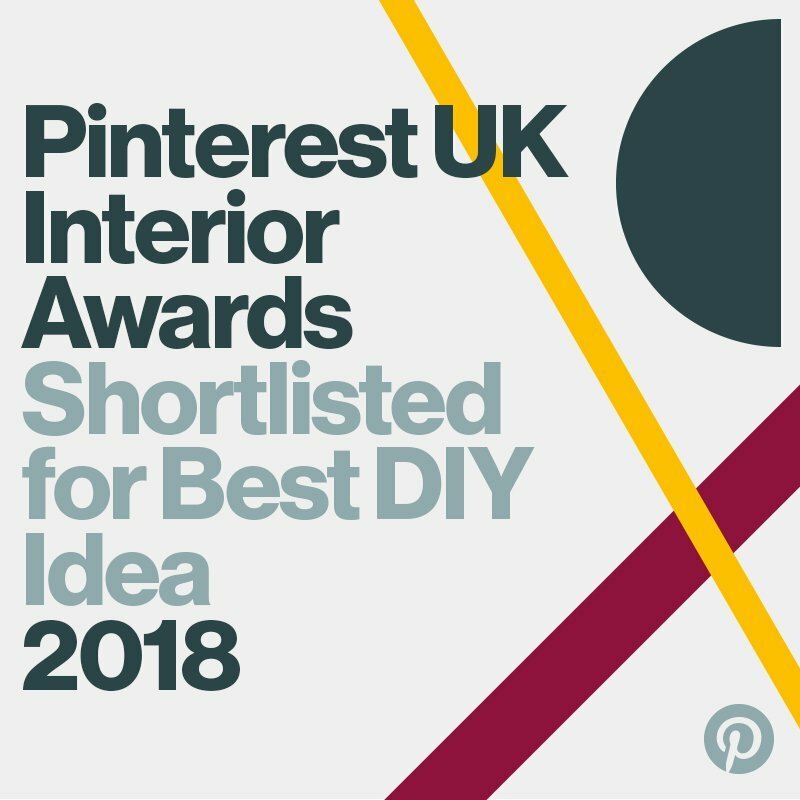 I have been following your stpping the skirting boards blog post which is great btw, and getting some equipment as per your own. I love also your switch covers, the silver ones with the white insets could you please let me know what they are / where you got them from ? How exciting, Keith, I love the architecture in Edinburgh! I hate seeing screws and other fixings which is part of the reason I loved our switches and sockets. These are the ones we used throughout the house: http://www.gil-lec.co.uk/switches-sockets/screwless-flatplates/hamilton-sheer-cfx/. Ours are stainless steel with white inserts. I don’t suppose you have any advice on removing the nails? We have 15 doors the same as yours and really hoping you have a tip on removing the nails. Some of them dont even have heads and snap off. Thank you, Joseph! I’m afraid I don’t have any time-saving tips – just pull them out with some pliers (it doesn’t matter if they have a head or not). I know it’s a pain but it’s really the only way to do it.